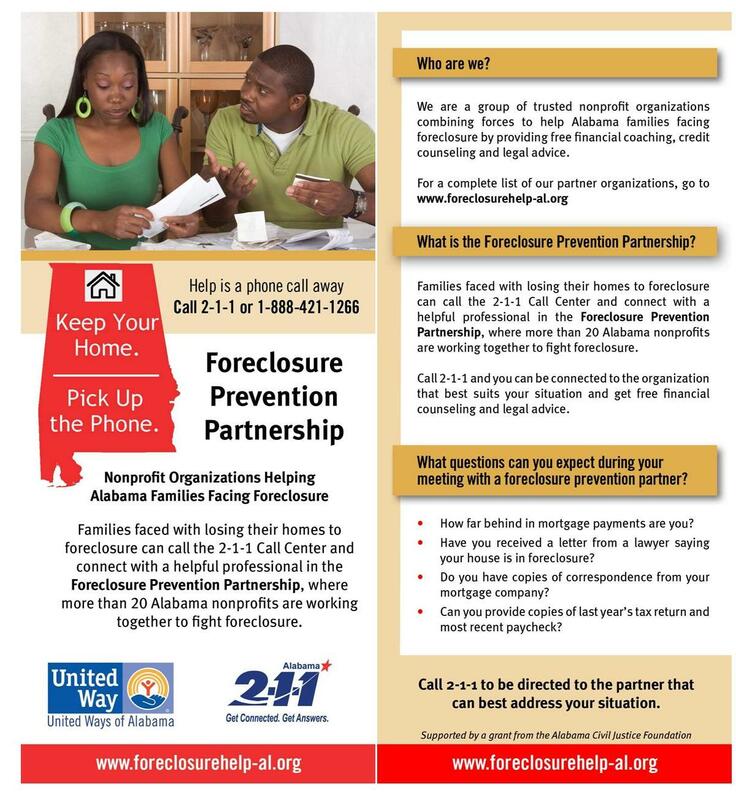 Foreclosure Prevention Partners – United Way of Central Alabama, Inc. Behind on Your Mortgage? Help is a Phone Call Away. Families faced with losing their homes to foreclosure can call the 2-1-1 Contact Center (or 1-888-421-1266) and get connected to a helpful professional in the Foreclosure Prevention Partnership – where over 30 Alabama nonprofits and community partners are working together to help families avoid foreclosure. By calling the 2-1-1 Contact Center, you will be connected to the foreclosure prevention partner that can best help with your individual needs – including free financial counseling and legal advice. What is the Foreclosure Prevention Partnership? It is a trusted group of nonprofit organizations and community partners that are combining forces to help Alabama families facing foreclosure. If you have questions or need assistance in locating a partner, please contact us at financialstability@uwca.org. Neighborhood Housing Services of Birmingham,Inc. For additional information contact financialstability@uwca.org or call 888-421-1266.